NEW YORK – When Frank Bruni stepped on the scene as the chief restaurant critic for The New York Times more than five years ago, many industry insiders and observers thought the choice was odd. Bruni had no previous experience reviewing restaurants. He hadn’t sweated long hours behind a hot range in a well-regarded kitchen learning his craft. He knew how to shape sentences but what did he know about simmering sauces? The revelation isn’t exactly shocking but it is unusual. Bruni, the man who had volunteered to eat out six nights a week, had obsessed about his weight for most of his life. He had battled bulimia briefly, toyed with laxatives and torpedoed many a diet — all the trimmings for his third book. “I remember thinking if I look up after a couple of years and I am right, and I have figured out a better way to manage my relationship with food, it’s probably a pretty interesting narrative how I got to this point,” Bruni says about the moment he decided to take the job. By the way, this “Wanted Poster” wasn’t constructed by Jeffery Chodorow, who likely doesn’t have that much imagination. It is the invention of the blog, Jaunted. 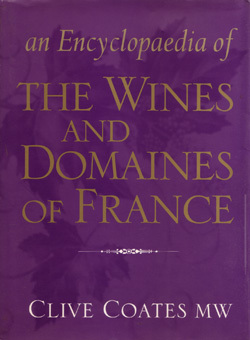 I have the original edition of this book (2000), which has the above pictured cover. It has been updated and sports a different cover. If you want the best view of France’s vine world, this is the ticket, albeit somewhat expensive if you buy it new. Coates covers every appellation, including Corsica, and drills down into the important characterizations of each. He highlights the important growers and négociants using a 3-star system of grading. There are copious maps and charts, but no photographs or other illustrations (at least in the 2000 edition). Well-written and entertaining in its rather dry and low-key fashion, this book is indispensable for any reasonable wine library. Highly recommended despite the rather high price. This site is one of the new breeds of blogs – the compendium. It’s not a single person laboriously typing blog post after blog post promoting a single viewpoint, but a group of single people typing blog post after blog post, blending viewpoints and outlooks from all over. Each has an area of expertise and a unique viewpoint. It’s a veritable bouillabaisse of blogs. Here you’ll find a wide-ranging and interactive culinary universe. There are waiters, home cooks, food critics and general know-it-alls. If you can’t find something of interest here, then you should re-evaluate whether you ‘re actually interested in the culinary world. It is a pretty commercial site, with garish ads that explode onto your screen and obscure the landscape. However, there’s nothing wrong with that, now is there? It looks like an upscale food court, and I mean this is the most positive way. This should be one of the sites that you regularly check in with, and, as such, it receives the ultimate honor here at SYWTBAW – it’s own place in the Foodie blogroll. This is the site of Esquire food editor John Mariani and it has a link to his Virtual Gourmet newsletter. There you can vicariously experience the wrold of dining and food. It’s a foodie’s delight, although you might sometimes feel like you’re outside looking in. In the current issue of the newsletter, Mariani surveys the Atlanta dining scene. So, look for the link in my Foodie blogroll. Caveat – I have the original 1991 edition, which has a different cover and is about 100 pages shorter. It’s the edition that won the James Beard Award for Cookbook of the Year. This is the book if you want all of the lowdown on classical sauces. If you ever wondered what the difference between a sauce and a glace is, this is the book for you. The first chapter is a history of sauces, the second, a compendium of equipment that you might need, the third a listing of ingredients. After that, he breaks down the various sauces and expands them to their variants as well. There are more sauces in classical cooking than you ever thought possible, many with French-derived names. And they are all listed in categories according to the basic recipe from which they spring. This book concentrates on classical sauces and there are essential tips scattered throughout, tips that will allow you to create sauces equal to those in the finest restaurants. I haven’t paged throught the more current addition pictured above, but I would hope that he’s extended his overview to Asian and other “non-western classical” offerings, as well as some of the new sauces based on more exotic ingredients. This is one of those “foundation books” that every serious cook should have in their cooking library. I’ll be reviewing his equally important book “Splendid Soups” in a future post. The books are a little dry, but they are intended to be reference works, not entertainment. Paula Wolfert has written extensively about “Mediterranean food”. No, this doesn’t mean Italian, which is what people usually mean by that term. She has a book on Southwest France, a book on Mediterranean clay pot cooking, a book on Eastern Mediterranean cooking (I’ll be spotlighting this book in a future post) and has written other books on the subject; in fact, she seems to studiously avoid Italian cuisine and tries to focus on under-served parts of the Mediterranean like Greece, The Balkans, Cyprus, etc. She’s a cultural anthropologist, a hungry traveler, a historian and a natural storyteller all rolled up into one. If your only exposure to Northern African food is couscous, you will have a new world of vibrant hot-climate flavors opened up to you. From preserved lemons to Bisteeya (squab pie), she’ll have you incorporating new flavor profiles into your cooking in no time. You can almost feel the heat of the desert and the smell and bustle of the souks as you page through her book. If you go there and find that it’s already been purchased, check eBay from time to time. I’m sure that a copy or two will turn up eventually. Alternatively, just buy the American edition. In the meantime, check out some of Paula’s other works. Some of this book is covered in some of her more sweeping compendiums of Mediterranean food. NYC leads with 8 entries, followed by LA with 5, and Las Vegas edging out Chicago 5 to 4. Gayot should be in any foodie’s favorite bookmark file.